Hello all, this is my first post so please bare with me here as I lay it all on the line. I've grown up in Seattle my whole life, have no ties to Detroit whatsoever. While growing up my dad and I would watch hockey night in Canada as often as we could, we would watch any game we could find at times. I grew up a Soccer player and have played up until about 3 years ago when I had the final straw that broke the Camels back as they say, when I broke my foot. In college I really started watching hockey with the accessibility of internet streams. I had always been affiliated with the Canucks as they were the closest team to me geographically. Let me tell you that was hard. so while in college i really thought to myself, it's time too pick MY team, a team who I really felt passionate for, a team who's playing a coaching style I really could respect and gravitated towards. I spent the 2021-13 season watching just about every team but the team I really gravitated towards was the Wings. I respected their persona as team they gave off and I really enjoyed Babs' coaching style (side note he ironically got his start as a coach for the Spokane Chiefs). So since about 2013 I really thought of myself as a Wings fan. I got a lot of funny looks from friends when i decided to "pledge my allegiance" to the Winged Wheel. But i didn't stop there, after watching them for 2 years solid and really getting invested in the team I decided it was time to really immerse myself in the culture and make my pilgrimage to "Mecca". I convinced my girlfriend to join me in taking a trip out to Detroit, not only to see a game but to see Detroit itself and see what they city was all about. I fell in love, the city welcomed us with open arms and every single person we met assured us that Detroit was not the city the media and other people are making out to be. I can say first hand that I saw that in this city that truly is turning a corner and is nothing like what other people portray it to be! Everyone was kind and made sure to tell us where we have to go and things we have to do while we were in town. People we so surprised and excited that we would come all the way from Seattle to take a vacation to Detroit, my own friends here thought we were crazy! We enjoyed out time and of course the game, they were playing the Stars and lost 4-0 not exactly how I had hoped my first visit to Hockeytown would go. Regardless I had a once in a lifetime experience going to the Joe before it was closed down, we also both found it funny that there were no cup holders which made the drinks go down a lot quicker While staying in an old historic home near Belle Island I had the chance encounter with the finish contractor of the home we were staying in. 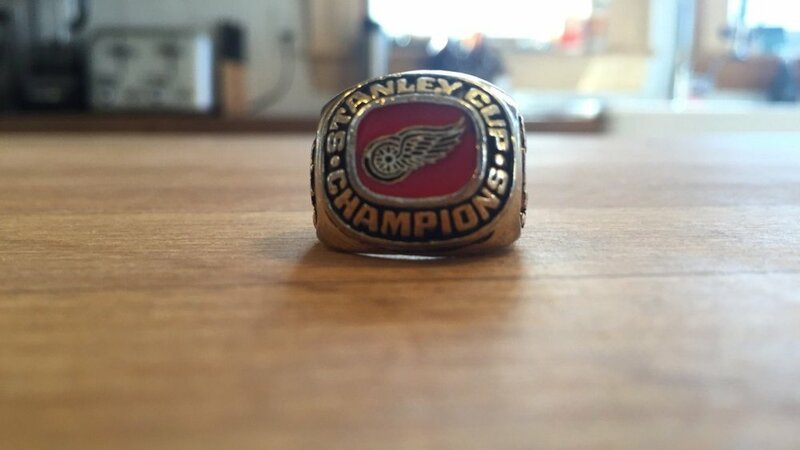 While shooting the breeze about historic home (i used to work in the seismic-retrofitting industry) he gave me a replica championship ring form the 1997 season which he said the Ilitch family gave out as a promo Little Caesars pizza combo. I still have that ring however it only fits my pinky-finger so its a great key-ring accessory. A few years later we made another Wings trip, this time to visit an old roommate who moved to Nashville, we went this last February and saw them squeak one past Pekka for a 1-0 win. I hope to make another trip out in the coming years to see the new arena and soo how much the city has progressed. So that's my story and i'm excited to learn more and get into the game more and if there any other Pacific Northwest Wings fans out there know you are not alone! Welcome! You're not alone. I've been in Seattle for a year now, one of the many transplants. If you ever wanna get a beer and hear my manifesto on Jimmy Howard lemme know. I'd relish that opportunity as I still am curious about the guy between the pipes.